Recent changes to the Studio 10 family has kept Sarah Harris on her toes. With 2 new co-presenters following a recent studio change and executive producer exit, it’s made the TEN show a 2.0 revamp before its 5th birthday on air. “I must say when I came back from maternity leave I had to sniff my armpits and think ‘Was it me? Something I said?’ Within a couple of months we saw Jess and Ita leave and I was devastated,” she told TV Tonight. 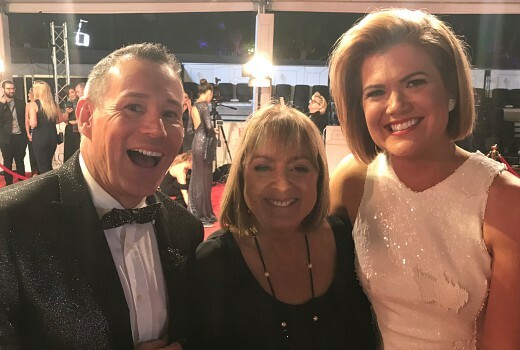 “They’re not replaceable but on a TV show that is driven by personalities we were lucky enough to have beautiful Denise Scott, who is Australia’s mum, and Angela Bishop who has been under-rated as a personality for so long. She is friggin’ smart, funny, got a political science degree, sassy. We see a great side of both. “When you are talking opinions all day it’s good to change things up. I knew what Jess and Ita were going to argue. But now we’re in the process -and I hope our viewers are as well- of learning something different about these 2 new hosts. Former Executive Producer Rob McKnight is yet to be replaced with an Acting Exec Producer currently installed. “I don’t know what that scenario is but we are all digging in, we’re all trying to make the best TV possible. And it’s a long show. We joke that it’s like putting together a telethon every day,” she said. From the get go I enjoyed Studio 10. Sarah has this natural ability in front of the camera. The original line up of Sarah, Joe, Jess and Ita was just the right mix along with their special guest for the day. Now? I don’t enjoy it as much. The departure of Jess and Ita has dampened my viewing. I’m missing Ita in particular as she has been in the game long enough to offer a strong opinion without the need to scream it. With the recent additions (excluding Angela) I can go weeks without looking at it. It may also have had something to do with those pushy infomercials. The departures and arrival of fresh talent has revitalised the show. Studio10 had really lost its way from around the time of the studio change. But now it has found its feet again. Angela is a fabulous addition who has proven to be far more than the ‘gossip reporter’ she has been painted as for years. I love Ange…been an admirer of her work for many years…also a fan of Denise Scott…. I liked the ladies that have left….but the change was not painful…I rarely watch in the mornings…..have to catch up on Tenplay….but long may Studio 10 go on. Agree the change was not painful, but Denise Drysdale remaining is quite painful. I’m only a semi regular viewer, but never watch during Denise Drysdale’s on week. I find Denise Drysdale too much of a ham and haven’t watched the show for ages. Now that Angela Bishop is on I might give it another go. Sarah Harris is a wonderful host and will be on air for many years to come. Maybe not on Studio 10 in future years but she is certainly a valuable asset to any Network. I like hearing Angela bishops inside knowledge of the entertainment industry. She tells it how it is. Another good little interview David. As Sarah said, it has been interesting to get to know Angela Bishops personality via her opinions and insight on various contentious issues. It’s such a pity Studio10 (and other morning shows) have to rely on revenue from those annoying advertorials. It would be a much better show without advertorials.